Metrology – the science of measurements – is responsible for the international uniformity and precision in standards. Today, the seven units for meter, kilogram, second, ampere, kelvin, mole, and candela of our international system of units (SI units) are used as a basis to express everything in nature by numbers and units. The first global system of units was introduced during the French Revolution with prototypes for the meter and kilogram. Even today, an artefact of platinum iridium is by definition the international unit of mass but this standard is not stable enough. 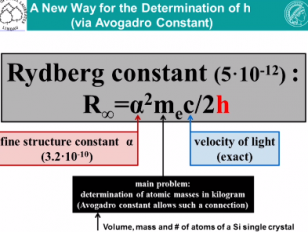 Therefore, the General Conference on Weights and Measures at his last meeting in November 2014 encouraged the international metrology community to complete all work until July 2017 necessary for a replacement of the current SI by a new system based on constants of nature. The quantum Hall effect (Nobel Prize 1985) plays a crucial role in this development, not only for the electrical units but also for the kilogram. What About Redefining Time Using a Stable Laser?